The highest honor bestowed upon an RSO, this award is presented to one exceptional RSO for its contributions to the campus community. The winner receives an award of $200, deposited into the RSO’s financial account. The selection committee’s decision is based in part on the extent to which the RSO’s contribution exceeds what is normally expected of an active organization, as well as the impact the RSO has had on the campus community. This award recognizes a new RSO (approved by CORSO during or after Winter Quarter 2017). The decision of the selection committee is based in part on the extent to which the RSO’s contribution exceeds what is normally expected of a newly formed organization. The winner receives an award of $100, deposited in the RSO’s account. This award recognizes the RSO that put on the most successful event this academic year (or after April 2017). While events that were co-sponsored by multiple RSOs will be considered, it should be noted that a “Best Collaboration Award” is also available. The decision of the selection committee is based in part on the uniqueness of the event, its appeal to different facets of the University community, and how smoothly the event was run. The winner receives an award of $100, deposited in the RSO’s account. This award recognizes outstanding collaboration on campus this year. The committee will consider individual RSOs that have made continued collaboration with other organizations a key component of their mission. The decision of the selection committee will be based on the creativity of the collaboration(s), as well as the extent of the RSO’s efforts to attempt collaboration. The winner receives an award of $200. 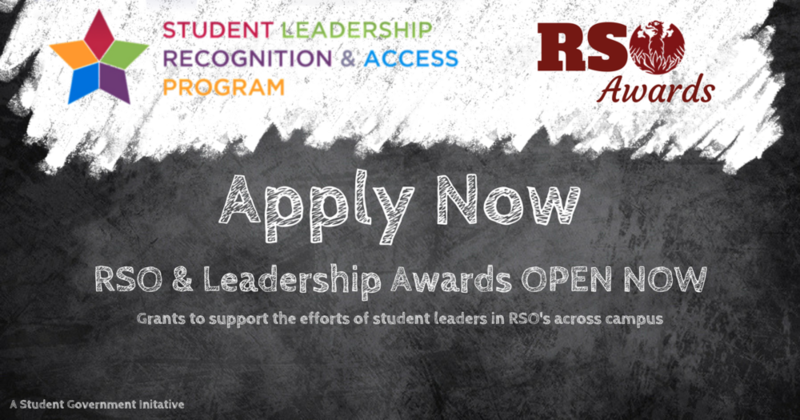 This award recognizes a RSO or event that has the most successful funding strategy this academic year (or after April 2017). The decision of the selection committee will be based on the inventive nature of the funding strategy as well as its success and sustainability. The winner receives an award of $100, deposited in the RSO’s account. An RSO’s and their events don’t have to involve hundreds of participants or be widely known to positively impact the campus community. This award recognizes a smaller or less well-known RSO or event that was exceptionally successful. The decision of the selection committee is based in part on the uniqueness of the event/RSO, its appeal to different facets of the University community, and, if an event, how smoothly the event was run. Events that were co-sponsored by multiple RSOs will be considered. The winner receives an award of $100, deposited in the RSO’s account. In collaboration with the College Council’s sustainability initiatives, CORSO is inaugurating an Environmental Sustainability award this academic year. This award will recognize an RSO that has been conscious of the environment in its daily practices, as well as in the implementation of events. Some examples of initiatives include, but are in no way limited to, paper-less advertising, avoidance of water bottles at events, composting at events, and recycling.